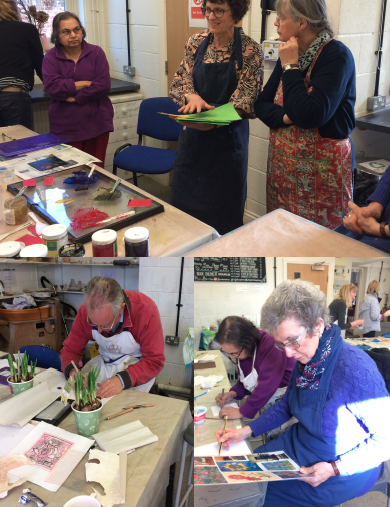 For 4 weeks in March, members of the Husthwaite Art Cafe were treated to 4 free tutor led community sessions sponsored by Rural Arts in Thirsk. 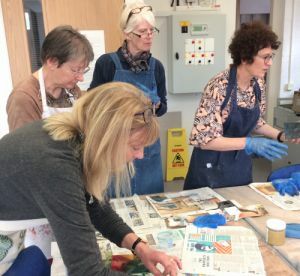 In the first 2 sessions the printing techniques of intaglio and collagraph were taught by Angela Hall, our excellent tutor. and everyone managed to get at least one good print even though the processes were sometimes challenging, and oily ink not an easy medium to use! We soon became expert at rolling the printing press, and what a delight to check how one's efforts had turned out. In the photos you can perhaps sense the concentration needed! In the 3rd and 4th sessions pottery techniques were explained, including details of various clays and oxide paints and glazes. Our tiles, bowls and slab pots are going to be glazed in the kiln at Thirsk. In each session we learned a lot of skills, as well as sharing a sociable and friendly morning together. Rural Arts has obtained a community arts grant for the village hall, to provide sessions of arts and crafts in the village hall for up to a year! These will continue on mornings on Thursdays. This news has just emerged, so afte discussions between the village hall and the manager of Rural Arts, details will be circulated later of the dates and exact times. Look out for flyers if you are interested, even if you haven't been before, and contact Lynn Colton 868092 to add your name to the list. We can then circulate information to you all.